There is a serious risk of flash floods in parts of Arizona, Utah and Colorado over the next three days. 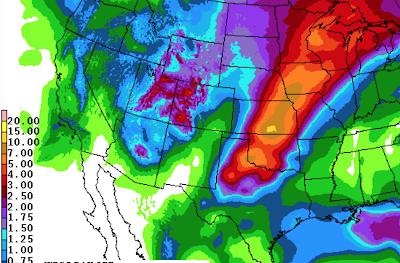 Farther east, there is a major risk of flooding from the Great Lakes to the Great Plains with the heavy to torrential rains forecast for the next seven days (illustrated above). In Kansas, if the 10"+ forecast is correct, this would likely be the worst flooding since October, 1998. Some of the computer models are showing areas of more than 13 inches of rain. The rain begins tonight. Dam operators should lower the water level to maximum flood pool. People in flood-prone areas should prepare a "go-kit." This includes passport, recent utility bill (to establish residence), family heirlooms, and other portable items that would be difficult to replace. Be prepared for an evacuation order or self-evacuate at the first sign of rising water. Keep your car full or nearly full of fuel. If physically able, have sandbags ready. Make sure you have at least two sources of weather warnings. Please note, in the event of ten inch rains, areas will flood that have never flooded before. Finally, there may be periods of severe thunderstorms and a tornado risk a times over the next five days.